Þorkell and Sjafi had the stone-slab(?) raised ... ... the good, and Heðinfast, his wife. May God and God's mother help his spirit. 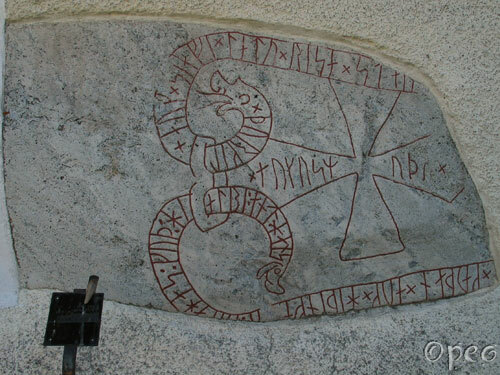 Like U 433, this rune stone is in the wall of Husby-Ärlinghundra church. The rune stone that's standing, at Arlanda airport, a few kilometres away, also came from Husby-Ärlinghundra parish.